The lives of the saints as well as their writings are one of the ways that we learn about the spiritual life. In reading attentively the lives of saints, one of the first things we learn is that the saints are neither distinctively Rus Man or Greek (nor any other nationality); they are at all times Orthodox and Christ-loving. They breathe forth the same spiritual fragrance no matter when or where they lived. 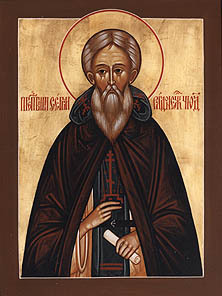 One of the most beloved Orthodox saints of Russia is St. Sergius of Radonezh whose life for countless generations of pious Orthodox, both young and old, served as a source of spiritual nourishment. And so it can for us, if only we read it not so much with our minds, as with our hearts. How many of us approach the reading of lives of saints, our minds clouded by doubt, skeptical about the miracles and thus blind to the treasure of holiness which they contain? Let us heed the example of the Greek bishop and beg God to open our mind’s eye, for only in this way shall our reading of these lives be spiritually fruitful. Baptized with the name Bartholomew, the growing boy was a poor student, unable to learn how to read. He often prayed to God in secret: “O Lord, give me understanding of . learning !” One day he met in the fields a holy elder of angel-like appearance who asked, “What are you seeking, my child?” The boy replied that he wished most of all to read and write. Assuring him that for his faith the Lord would give him learning, the elder at the boy’s entreaty accompanied him to his parents’ house. They all went into the house chapel and the elder told the boy to read aloud from the Psalter. “Father, I do not know how,” Bartholomew said. But after the eder commanded him to “Speak the word of God without doubt,” the boy began to read easily. Then the elder foretold to the parents that their son would be a dwelling of the Holy Trinity, that he would be great before God and man, and that he would-direct others thanks to his virtuous life. Some time later it fell on Bartholomew to care for his parents in their old age, a task he willingly undertook, although he wanted to” become a monk. After his parents died he abandoned the world and, together with one of his brothers, went deep into the forest to build a cell and a small church, dedicated to the Holy Trinity. His brother was unable to remain long with him, so Bartholomew continued in the forest alone, At the age of 23 he received the monastic tonsure with the name Sergius. Late one night when the Saint was praying, he heard a · voice calling. ‘ ‘Sergius, “Opening the window of his cell he beheld a marvelous vision . . . an extraordinary radiance shone in the heavens and a multitude of beautiful birds filled the air. St. Sergius worked at grinding grain, baking bread, cooking food. and making candles, as well as making shoes and clothing for the other monks. “He never spent an idle hour. Remaining thus in ceaseless prayer and labors, he completely wore out and refined his flesh, having the Constant desire to be a citizen of the Jerusalem that is above .” Over and over he reminded his monks: “God’s grace cannot be given without trials; after tribulation comes joy. Multitudes flocked to him, wishing to be part of this growing family of monks. When dissensions arose, the Saint did not enter into them, preferring, as when the monks would not accept correction, to be silent rather than participate in any strife. Once after prayer before an icon of the Mother of our Lord Jesus Christ, a dazzling radiance shone upon him and he beheld the Most Pure One, together with the Apostles Peter and John. The bright light of the vision was unbearable, and he fell to the ground. But the Mother of God, touching him, promised that she would be with his monastery during his life and afterwards, protecting it. The Mother of God has kept her promise to St. Sergius. His monastery is one of the last to remain open under the Soviet Yoke, and countless pilgrims still come to venerate his holy and incorrupt relics. Note: This is an especially good life to retell to our children (see “Parents, Children and Lent”, p. 6). Explain to them that St. Sergius is called (in his troparion), an “athlete of virtues” because those who exercise, or practice, the virtues are just as much in training for a competition or contest as modern-day athletes in the sports arena. The difference is that whereas the merely physical athlete competes for an earthly, passing glory, the “prize” for a spiritual athlete is the unending bliss of Paradise.